Original Institutional Economics (OIE), and other non-mainstream economics paradigms, tend to look holistically at socioeconomic behavior. From the OIE perspective, a society’s institutions, the implicit and explicit rules governing behaviors, are expected to shape individual and social behavior. Broadly defined, corrupt behavior can be found anywhere, at any time, but evidence suggests that, in some countries, corrupt behavior is more ubiquitous than in others indicating that corruption has become institutionalized. This paper analyzes two groups of countries: one group in which the level of corruption has been consistently perceived to be low and another in which the level of corruption has been consistently perceived to be high. Several social/institutional indicators are examined to see which, if any, institutional characteristics vary across the two groups. The research is exploratory and its purpose is to gain insight into social/institutional conditions that may discourage or encourage consistent corruption. Although difficult to measure or clearly identify, researchers generally agree that corruption is widespread and, for the most part, damaging to society. “Corruption, as anyone knows, is a ubiquitous aspect of the exercise of governmental power and the transactions that go with it” (LaPalombara 1994, p. 327). Rose-Ackerman and Palifka (2016) count at least 12 negative consequences of corruption ranging from low economic growth to increased health and safety risks (p.28). Lui declares that “[c]orruption occurs in all countries, irrespective of whether they are rich or poor, dictatorships or democracies, socialist or capitalist” (Lui 1996, p. 26), Recently, Buchan and Hill (2014) begin their history of political corruption with the statement, “[a]lthough corruption has been ‘ubiquitous’ throughout human history and in all kinds of societies, it has not always been a subject of great interest” (Buchan and Hill 2014, p. 1). Corruption’s ubiquity is evident in the many reports provided in the press. For example, O’Grady (2015) recounts corruption in worldwide soccer governance, among judges in Ghana, in tariff administration in Honduras and Guatemala, and even in the United Nations. According to Nazaryan (2017), the United States, never exempt from corruption, appears to be experiencing increasing issues at the national level. Although ubiquitous, levels of corruption, to the extent they can be measured, are not equal across nations. Some nations are consistently perceived to be highly corrupt while others are consistently perceived to be less corrupt. The consistency over years suggests that corrupt actions and tolerance for corruption have institutional characteristics, that is, in some countries corruption is a noticeable and ongoing pattern of behavior involving a number of people. Social rules, explicit or implicit, guide the patterned behaviors and, there are folkways that justify the behaviors (Neale 1987). The consistency of corruption in some nations hints that corrupt behavior has become institutionalized and, perhaps, ceremonially encapsulated. To be encapsulated implies that “the community initially responds to the existence of a technological innovation [anti-corruption reform] with its associated changes in correlated patterns of behavior only to the extent that it can do so without disrupting the existing system of status and power” (Bush and Tool 2003, p. 27). The purpose of this paper is to better understand the extent to which corruption is an institutional issue. To begin, a brief analytical backdrop and a general discussion of corruption are provided. Then, two distinct groups of nations are identified, one to represent nations where corruption is consistently perceived to be low and another to represent nations where corruption is consistently perceived to be high. The two groups are then compared across several dimensions to identify the extent to which other socioeconomic outcomes/characteristics/institutions are related, or not, to consistent corruption. The approach is exploratory and the evidence provided is largely descriptive but can potentially provide a foundation for further empirical work on corruption. Based on a thorough examination of empirical studies of corruption, Rose-Ackerman and Palifka (2016, p. 27-36) identify several causes of corruption across three categories, incentives, personal ethics, and institutions. Regarding institutions, they propose that political structure, legal structure, rule of law, and culture condition a nation’s experience with corruption. Specific definitions of these institutions are not provided and they might be better described is composite institutions. Still, the mere acknowledgement of institutions as causal factors raises interesting questions about institutional characteristics and their relation to corruption. Without discounting the impact of incentives and personal ethics, this paper focuses on institutions and corruption. Original institutional economics informs the worldview that guides this work. The focus of institutional analysis is, unsurprisingly, institutions. Neale (1987), cited above, identified institutions as patterned human behavior, guided by rules, and justified by folkways. Hodgson (2006) proposes that institutions “are systems of established and embedded social rules that structure social interactions” (p. 18). Commons (1931) describes an institution as “collective action in control, liberation and expansion of individual action” (p. 648). All of these definitions suggest that human behavior is governed by things beyond the individual. Behaviors that are institutionalized become habitual behaviors and, once habituated, difficult to change. 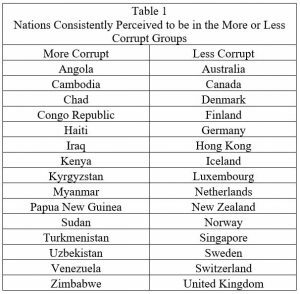 The nations identified below demonstrate consistency in their behavior, with respect to corruption, suggesting that the behaviors have been institutionalized, for better or worse. Institutions form as humans seek to provide for themselves in the face of their natural, technological, and cultural environments. Institutionalized ways of doing and being vary with the context in which they develop. Once established, changing demands from their environments, especially the natural and technological environments, place pressure on institutions to evolve and adapt to new circumstances. Whether institutions evolve with changing circumstances depends largely on whether folkways (culture) can justify the new rules of behavior and whether those who benefit disproportionally from the existing institutional structure have the power to resist institutional evolution (Adkisson 2010). Where institutions fail to evolve, a society’s ability to provide for itself can be constrained. In other words, existing institutions can be past-bound and thus remain unevolved or under-evolved and prevent the emergence of new, and possibly more serviceable, institutions. Progress toward better social provisioning is retarded or, perhaps, prevented. In the present case, both groups of nations demonstrate consistent, institutionalized, behavior with respect to corruption with one group being consistently more corrupt and the other consistently less corrupt. In proposing that incentive structures and institutions (tempered by personal ethics) are the causes of corruption, Rose-Ackerman and Palifka (2016) also emphasize that institutions, ethics, and incentives are interrelated. Causal variables are unlikely to be independent from one another and the direction of causation is likely to be ambiguous causing problems in empirical analyses. In the present case, no attempt is made to establish causation. Rather, the focus is on identifying institutional characteristics that appear to coexist with the existence or non-existence of consistent (institutionalized) corruption. Rather than simple correlation, corruption likely presents a case of circular causation where a variety of influences drive virtuous and vicious cycles moving the society either upward or downward (Myrdal 1974). For several decades, organizations such as the World Bank[i] and Transparency International[ii] have focused on bringing corruption out of the shadows in the hopes of reducing corruption worldwide. While there has been some progress, the problem persists. At least part of the problem is to agree on the definition of corruption and how it can be measured. Defining corruption can be equally difficult and equally subjective. Transparency International provides a general definition, “the abuse of entrusted power for private gain. [iii]” The World Bank’s general definition is “the abuse of public office for private gain. [iv]” LaPalombara (1994) proposes that “corruption is behavior by a public servant, whether elected or appointed, which involves a deviation from his or her formal duties because of reasons of personal gain to himself or herself or to other private persons with whom the public servant is associated” (p. 328 emphasis in original). While the emphasis is typically on the abuse of public power, both LaPalombara (1994) and Myrdal (1968) point out that there is typically a private entity at one end of a corrupt transaction. Public corruption implies private complicity. Kurer (2005) reviews past efforts to provide objective definitions of corruption to include the public opinion, public interest, and public office definitions associated with Heidenheimer (1970). As suggested by the terms, the public opinion definition is based on public opinions and the public interest definition is based on public interest; the problem being that neither public opinion nor interest are uniformly defined and so provide weak definitional anchors. The public office definition defines corruption as violations of the formal rules of office, a somewhat objective but not universal criterion. Ultimately, Kurer suggests a definition based on the impartiality principle; “a state ought to treat equally those who deserve equally” (Kurer 2005, p. 223). He argues that corrupt acts “are characterized by a holder of public office violating non-discrimination norms in order to gain a private advantage” (p. 227). Unfortunately, although he proposes that this definition is universal, variations in cultural values, beliefs about corruption and difficulty in measuring actual levels of corruption create a paradox. In the end attempts to measure and compare corruption across time and place become difficult, even if one knows when one sees it. By separating nations with consistent CPI results from those with more inconsistent or volatile results ambiguous cases are (hopefully) reduced or eliminated. The CPI is the basis for identifying the two groups of nations examined in this study. The time period, 2005-2016 was selected because fewer nations were regularly reported prior to 2005. Over the 2005-2016 period, CPI values and rankings are available, at least once, for 190 nations including 147 nations with CPI values and rankings reported for each of 12 years. Beginning with the 147 consistently reported nations, a sorting process resulted in the identification of 15 nations that were consistently ranked among the 20 least corrupt (by perception) nations and 15 nations that were consistently ranked among the 32 most corrupt (by perception) nations. The result of this process was to identify the two groups of nations shown in Table 1. Note that these do not necessarily represent the most or least corrupt of all nations. The initial 147 nations included many nations that were inconsistently ranked and therefore did not meet the criteria for inclusion. Because no index is perfect, the groups identified were checked for consistency with two other publically available corruption measures. The World Governance Indicators (WGI) Control of Corruption (CC) index “captures perceptions of the extent to which public power is exercised for private gain, including both petty and grand forms of corruption, as well as ‘capture’ of the state by elites and private interests” (Kaufmann, Kraay and Mastruzzi 2010). The CC index has a range of -2.5 to 2.5 with higher values representing more successful control of corruption. The Heritage Foundation’s Government Integrity (GI) index seeks to identify “the extent to which corruption prevails in a country” (http://www.heritage.org/index/freedom-from-corruption). The GI index builds on the foundation of the CPI but incorporates evidence from several other sources to derive the index. 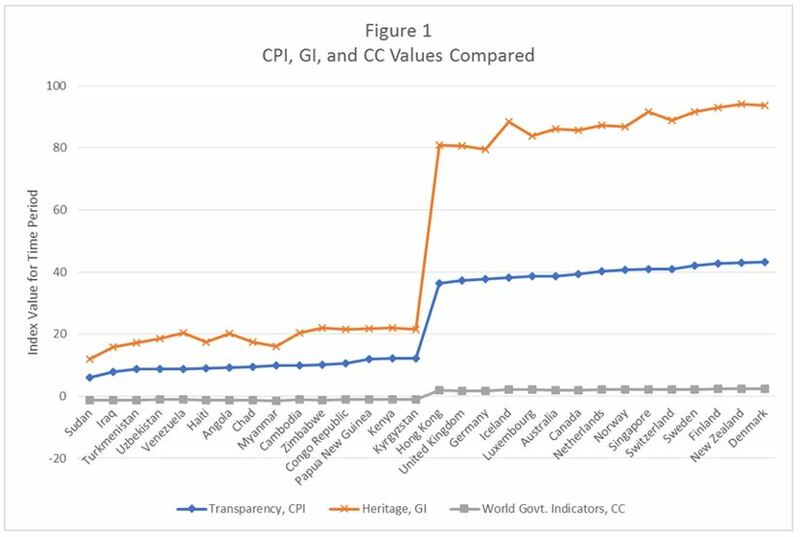 The range of the GI index is 0-100 with higher values representing less prevalent corruption. 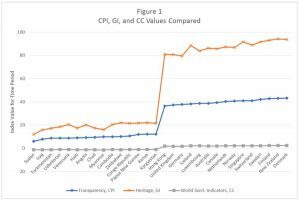 Figure 1 arrays the countries in Table 1 from the lowest period-average CPI value nation on the left to the highest period-average CPI value nation on the right and then provides CPI, CC, and GI period-average values for comparison. This bit of evidence suggests that the groups identified in Table 1 are not a random artifact of the CPI methodology. The CPI may be an imperfect measure but at least it is consistent with alternative measures of corruption. To further justify the composition of the two groups of nations, hypotheses tests proposing that mean values of the indices (CPI, GI, and CC) were equal across the two groups were conducted. In every case, the hypothesis of equal means was rejected and there was no overlap between the ranges of the group scores for any of the indices adding further evidence that the two groups identified are distinct in terms of perceived corruption. 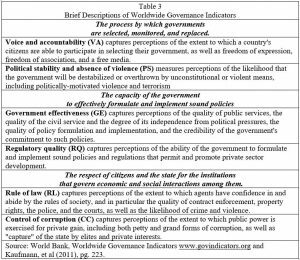 Rose-Ackerman and Palifka (2016) identified four composite institutions associated with the existence of corruption, political structure, legal structure, rule of law, and culture. Institutions are nuanced and not readily comparable or quantifiable. However, several indices purporting to capture social/institutional/cultural differences across nations are available and will be used here in an effort to relate relative institutional characteristics to corruption perceptions. Over the past decade or two, researchers have created several composite indices to summarize and capture social characteristics so that they can be compared across nations and through time. Indices have been produced to measure the ease of doing business, environmental vulnerability, global terrorism risk, press freedom, and similar phenomena (Bandura and Martin del Campo 2006). The richness of the concepts being measured makes the task difficult but, according to Foa and Tanner (2012) the indicators project has expanded for at least four reasons (pp 2-3). A composite measure has the ability to summarize complex or multi-dimensional issues in a simple manner. They provide a single estimate that is easier to interpret when compared to interpreting multiple benchmarks. The commitment to produce and regularly update the indicators facilitates communication with stakeholders and shows commitment by the agencies producing them. The act of creating the indices encourages active debate over the definition and measurement of complex concepts. In some cases it is difficult to tie specific social indices to the specific institutions identified by Rose-Ackerman and Palifka (political structure, legal structure, rule of law, and culture 2016). As mentioned above, the focus here is to establish the coexistence of corruption and particular institutional characteristics. Simple methods are employed to ask whether there statistical detectable differences in the institutional characteristics of more corrupt versus less corrupt nations. Although simple statistics are used, conclusions regarding the corruption/institutions nexus are based as much on the preponderance of the evidence as on the formal hypothesis tests. Fractionalization occurs when an entity is broken into parts. For this measure, the society is the whole and the identifiable subgroups within the society are its parts. Alesina, et al. (2003), develop a simple index to represent the extent of social fractionalization within a nation or other region. They use the index to measure ethnic, religious, and linguistic fractionalization for 190 countries. To create the index, one first identifies the different ethnic, religious, and linguistic subcategories represented in each nation and the shares each subcategory contributes to the whole. The fractionalization index is one minus the nation’s Herfindahl-Hirschman index where the shares in each subcategory are squared and summed up as in the equation below. For each category, religion, ethnicity, or language, N subgroups are identified and indexed using the subscript “i”. Each subgroup “i” constitutes an “s” share of the total population in nation j. The index can take on values from zero to near one. 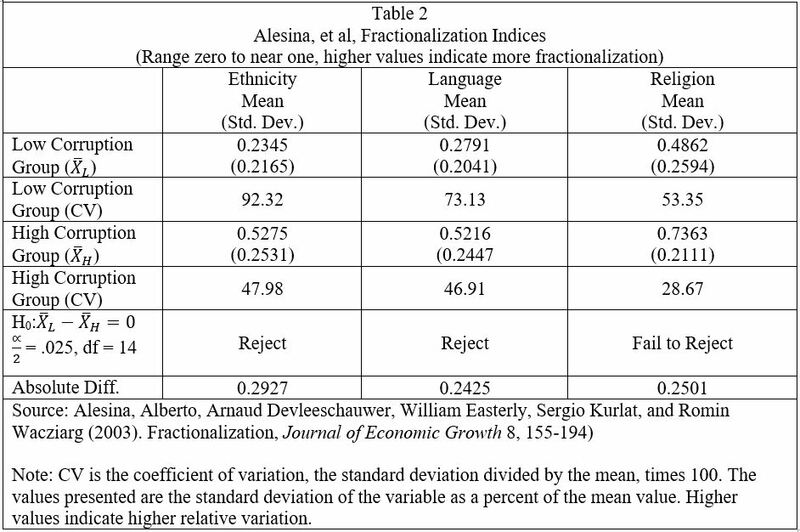 If the entire population fits in one single ethnic, religious, or linguistic group, the fractionalization index takes a value of 0 indicating no fractionalization. A value of near one indicates a very high level of fractionalization. For example, if a nation with a population of 1,000 had 10 people in each of 100 subgroups, the fractionalization index would have a value of .99. The value of the index increases as there is more fractionalization. The reliability of the fractionalization index depends on the quality and accuracy of the inputs. Unfortunately there is no single, reliable source of data on religion, language, and ethnicity and different sources tend to define and classify things differently. For example, some sources conflate race and ethnicity when defining ethnicity. Alesina, et al (2003) rely heavily on Encyclopedia Britannica as a source which they supplement with data from the CIA World Factbook and other sources. While these sources are not perfect, the authors compare their indices to those generated by other methods and find them to be consistent with previous research. Similarly, although the data used to create the indices comes from different years, Alesina, et al (2003) argue that societal fractionalization changes slowly and therefore can be considered exogenous and constant at least over the medium term, 20-30 years. 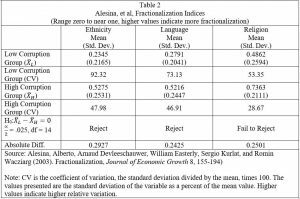 Table 2 provides fractionalization statistics for the two groups of interest in this paper. 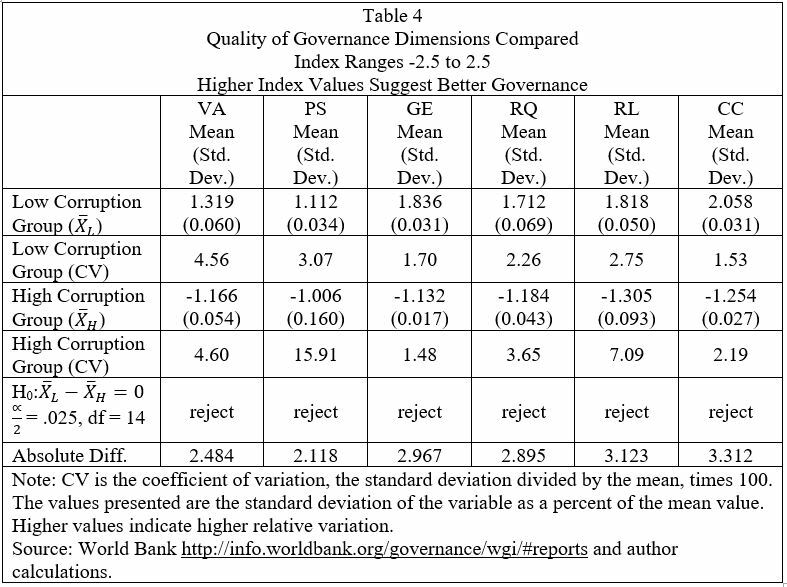 As shown in Table 2, the low corruption group has lower mean fractionalization index values in all three categories. In itself, this suggests that higher corruption countries are more fractionalized (diverse) with respect to ethnicity, language, and religion. There is also a difference in within-group variation. 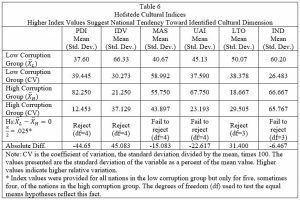 The coefficients of variation indicate that the index values for the low corruption group are relatively more widely dispersed around their mean values than are the index values in the high corruption group. For the religion category one cannot reject the equal-means hypothesis using the alpha=0.05/2 criterion. This is consistent with previous findings (Shadabi 2013). However, the equal means hypotheses is rejected for the ethnicity and linguistic indices suggesting that ethnically and linguistically fractionalized countries tend to have higher levels of perceived corruption, on average. Table 3 provides brief descriptions for the governmental dimensions measured by the WGI. For a nation to display more of the characteristics described is considered better. Methodological details are available from Kaufmann, et al, 2011). Table 4 provides WGI information for the two groups under scrutiny. Comparing the two groups reveals that, by WGI standards, nations in the low corruption group have better governance than do nations in the high corruption group. In all six governmental dimensions, the low corruption group WGI scores are larger (better) than are the WGI scores of the high corruption group. In two cases, political stability and lack of violence (PS) and rule of law (RL), the coefficient of variation indicates that within group variation is much larger among the high corruption countries than it is in the low corruption countries. At the alpha=0.05/2 level, the hypotheses that the means for the two groups are equal is rejected for all six governance dimensions. Perhaps not surprisingly, less corrupt countries tend to have better governance than more corrupt countries. Culture, briefly defined as “the collective programming of the mind which distinguishes the members of one category of people from another” (Hofstede 1994, 12), is considered to be an important factor in economic matters by economists of many stripes. As rich as the cultural concept is, many researchers have attempted to simplify and quantify cultural dimensions, thus allowing cross-cultural comparisons (Adkisson 2014). The best known and widely cited of these attempts comes from Hofstede (1980). 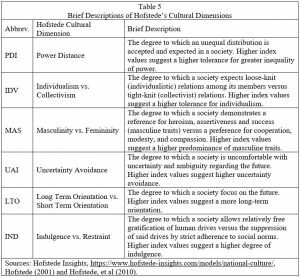 After surveying executives around the world in the 1960s, Hofstede posited four cultural dimensions, power distance, individualism versus collectivism, masculinity versus femininity, and uncertainty avoidance. Building on this foundation, Hofstede and his research team eventually expanded the list to include two more dimensions, long-term versus short-term orientation and indulgence versus constraint. Brief descriptions of each dimension are provided in Table 5. The index values generally fall in the 0-100 range with higher values reflecting stronger national tendencies toward the particular cultural dimensions, power distance, individualism, masculinity, uncertainty avoidance, long-term orientation, and indulgence. Unlike the WGI indexes, there are no normative judgements attached to the index values. They simply reflect different cultural characteristics. High or low index values do not imply goodness or badness, just difference. Although culture can be important in shaping worldviews and opinions, it should not be considered to be deterministic. Culture may limit the range of socioeconomic behavior but it does not force particular outcomes. According to Hayden (1988) “cultural values are not deterministic because numerous alternative beliefs and institutional arrangements can satisfy a set of [cultural] criteria” (pg. 417). 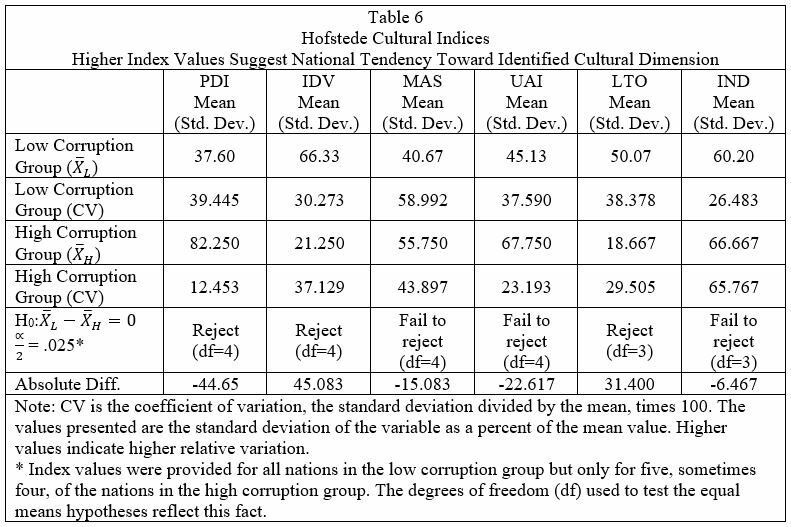 Still, the evidence provided in Table 6 at least suggests that cultural tendencies in more and less corrupt nations are different. Given that the cultural indices are not available for the majority of high corruption countries, caution in interpreting the evidence is advised. Given this, the equal-means hypotheses can be rejected for three of the six cultural dimensions, power distance, individualism, and long term orientation. Although limited, the evidence suggests that high corruption nations tend to have cultures with greater power distance, to be less individualistic, and to be more short-term oriented than are the less corrupt nations. Based on the analysis above but being careful not to claim or identify the direction of causation, the following statements are warranted. Tend to be more ethnically and linguistically fractionalized than are nations perceived to consistently less corrupt. Religious fractionalization does not seem to be a factor. 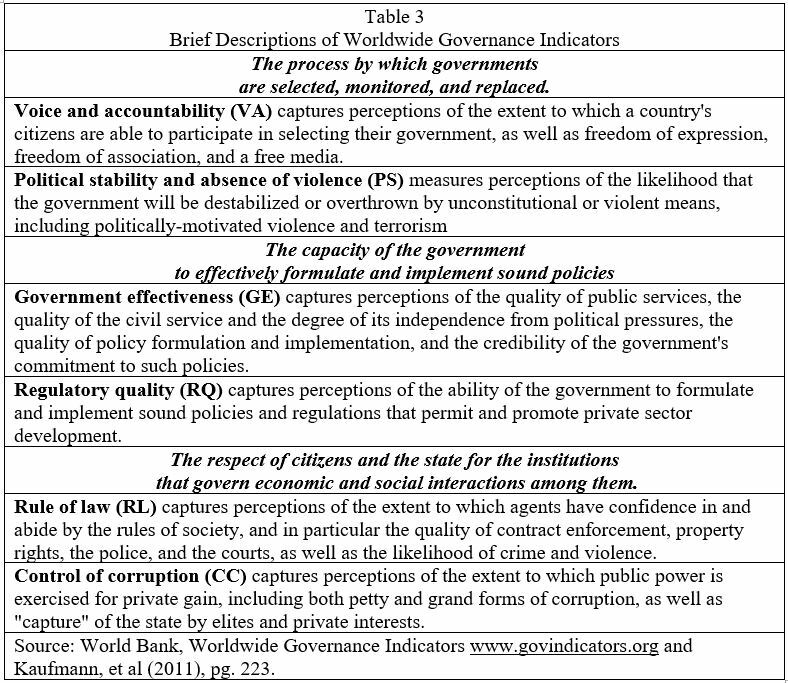 Tend to have lower quality of governance in all dimensions measured by the World Governance Indicators than do nations perceived to consistently less corrupt. Tend to display more power distance than do nations perceived to consistently less corrupt. Tend to be less individualistic than are nations perceived to consistently less corrupt. Tend to be more short-term oriented than are nations perceived to be consistently less corrupt. Rose-Ackerman and Palifka (2016) argue that institutions are among the causal factors leading to corruption. 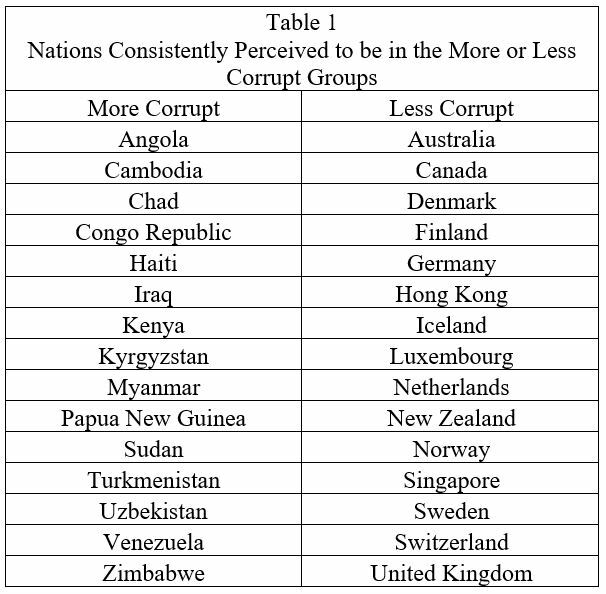 Without intent to either prove or disprove this proposition, this paper identifies two groups of nations, one of nations consistently perceived to be among the least corrupt and the other of nations consistently perceived to be among the most corrupt, and explores differences in institutional characteristics across the two groups. Several statistically detectable differences are found. Further analysis would likely reveal more, and perhaps more detailed, differences. At a minimum, the evidence provided above show Rose-Ackerman and Palifka’s general proposition to be warranted. It appears that institutional characteristics, in several dimensions, do vary across the two groups. Overall the work suggests that to ignore institutions in studies of corruption is ill-advised and that policies aimed at reducing corruption must do more than simply change the structure of incentives. Adkisson, Richard V. “The Original Institutionalist Perspective on Economy and its Place in a Pluralist Paradigm.” International Journal of Pluralism and Economic Education 1, 4 (2010): 356-71. Adkisson, Richard V. “Quantifying Culture: Problems and Promises.” Journal of Economic Issues 48, 1 (March 2014): 89-107. Alesina, Alberto, Arnaud Devleeschauwer, William Easterly, Sergio Kurlat, and Romain Wacziarg. “Fractionalization.” Journal of Economic Growth 8 (June 2003): 155–94. Bandura, Romina and Carlos Martin del Campo. “Indices of National Performance: A Survey.” New York: United Nations Development Program. (June 2005). Buchan, Bruce, and Lisa Hill. An Intellectual History of Political Corruption. Springer, 2014. Bush P.D., Tool M.R. Foundational Concepts for Institutionalist Policy Making. In: Tool M.R., Bush P.D. (eds) Institutional Analysis and Economic Policy. Springer, Boston, MA (2003): 1-46. Commons, John R. “Institutional Economics.” The American Economic Review 21, 4 (1931): 648-57. Hayden, F. Gregory. “Values, Beliefs, and Attitudes in a Sociotechnical Setting.” Journal of Economic Issues 22, 2 (June 1988): 415-26. Heidenheimer, Arnold J. “Introduction.” in Arnold J. Heidenheimer (ed. ), Political Corruption: Readings in Comparative Analysis. New York: Holt, Rinehart, and Winston.” (1970): 2-28. Hodgson, Geoffrey M. “What Are Institutions?” Journal of Economic Issues 40, 1 (2006): 1-25. Hofstede, Geert. “Business Cultures: Every Organization has its Symbols, Rituals, and Heroes.” UNESCO Courier (April 1994): 12-16. Hofstede, Geert. Cultures Consequences: Comparing Values, Behaviors, Institutions, and Organizations across Cultures. Thousand Oaks: Sage Publications. (2001). Hofstede, Geert, Gert Jan Hofsteed, and Michael Minkov. Cultures and Organizations Software of the Mind, 3rd. Ed. McGraw Hill. (2010). 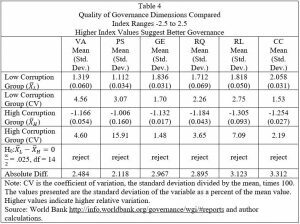 Kaufmann, D., A. Kraay, and M. Mastruzzi “The Worldwide Governance Indicators: Methodology and Analytical Issues,” Policy Research Working Paper 5430, World Bank. [2181, 2202] (2010). Kurer, Oskar. “Corruption: An Alternative Approach to its Definition and Measurement.” Political Studies 53, 1 (2005): 222-239. LaPalombara, Joseph. “Structural and Institutional Aspects of Corruption.” Social Research (1994): 325-350. Lui, Francis T. “Three Aspects of Corruption.” Contemporary Economic Policy 14, 3 (1996): 26-29. Myrdal, Gunnar. Asian drama, an inquiry into the poverty of nations. New York: Pantheon. (1968). Myrdal, Gunnar. “What is Development?” Journal of Economic Issues 8, 4 (1974): 729-736. Nazaryan, Alexander. “Trump is Leading the Most Corrupt Administration in U.S. History, One of First-Class Kleptocrats.” Newsweek. Nov. 2, 2017. Accessed December 15, 2017. http://www.newsweek.com/2017/11/10/trump-administration-most-corrupt-history-698935.html. Neale, Walter C. “Institutions.” Journal of Economic Issues 21, 3 (1987): 1177-1206. O’Grady, Siobhán. “The Worst Corruption Scandals of 2015.) Foreign Policy. December 29, 2015. Accessed December 15, 2017. http://foreignpolicy.com/2015/12/29/the-worst-corruption-scandals-of-2015/. Rose-Ackerman, Susan and Bonnie J. Palifka. Corruption and Government: Causes, Consequences, and Reform, 2nd Ed. Cambridge: Cambridge University Press. (2016). Shadabi, Leila. “The Impact of Religion on Corruption.” Journal of Business Inquiry 12, 1 (2013): 102-117. [i] For example see “Good Governance and Development – A Time for Action, Jakarta, Indonesia: (2006, http://documents.worldbank.org/curated/en/938181467987875500/pdf/101339-WP-Box393261B-PUBLIC-2006-04-11-PW-Good-Governance-and-Development.pdf) , Six Strategies to Fight Corruption (2014, http://blogs.worldbank.org/futuredevelopment/six-strategies-fight-corruption), and Helping Countries Combat Corruption: The Role of the World Bank” (1997, http://www1.worldbank.org/publicsector/anticorrupt/corruptn/corrptn.pdf).